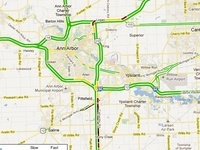 Posted on Thu, Jan 26, 2012 : 8:04 a.m.
Crashes are slowing traffic on Ann Arbor-area freeways this morning. Motorists may encounter delays on US-23 south of Ann Arbor from a pair of crashes this morning. State police were on the scene of a crash near Willis Road, a dispatcher said about 8 a.m.
Another crash a short distance to the north had already been cleared, he said. No serious injuries were reported. A Google map showed a significant backup on northbound US-23. Police are also dealing with a crash on westbound M-14 near Earhart Road. The crash was not believed to be blocking the freeway, but no other information was immediately available. Traffic slowdowns are shown in black, red and yellow on the map. Thu, Jan 26, 2012 : 2:30 p.m.
Good thing AA spent money on art in front of City Hall instead of expanding 23 and 94. Guess they don't really care about the low life commuters. Much better to spend money for something that's right in front of the building they work in, especially since it's other peoples money. I bet they're even telling us that it's too expensive to expand 23 and 94 while looking at their art! Thu, Jan 26, 2012 : 3:14 p.m.
Thu, Jan 26, 2012 : 2:35 p.m.
Why would Ann Arbor pay to expand a federally owned, operated, and maintained highway? Last time I checked, I-94 was part of the interstate highway system, and the US in US-23 should be self-explanatory. Thu, Jan 26, 2012 : 1:23 p.m.
What are there isolated pockets of snow out there? Gee according to some that post here. Accidents Only happen because of the road commission! Who would have thought driver error could ever be the reason. Thu, Jan 26, 2012 : 3:55 p.m.
Its always someone else's fault never the drivers. Thu, Jan 26, 2012 : 3:12 p.m.
Yep, it's all the WCRC's fault no matter what. That way people don't have to take responsibly for their own actions, i.e. not obeying traffic laws, texting/talking on cell etc. Thu, Jan 26, 2012 : 3:01 p.m.
Thu, Jan 26, 2012 : 2:44 p.m.
Thu, Jan 26, 2012 : 2:25 p.m.
Nope, never said they &quot;only&quot; happen due to our poorly maintained roads. But that is a big cause, in my opinion, for so many accident on the freeways surrounding Ann Arbor when we get snow. They don't start salting early enough and give it time to work and they refuse to use sand where it is warranted. Thu, Jan 26, 2012 : 1:45 p.m.
Thu, Jan 26, 2012 : 1:44 p.m.